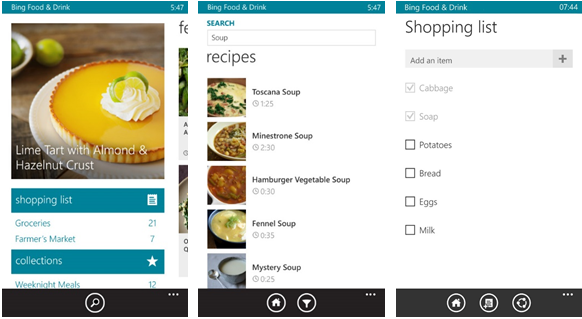 Microsoft has announced that its recently introduced Bing Food & Drink, Bing Health & Fitness and Bing Travel apps for Windows Phone 8 devices are now freely available to download having shaken off the beta tag of the earlier versions released in January. While none of them are strictly ‘new’ – they all exist on Windows 8.1, as well as being available in beta for Windows Phone – the launch ties the platforms ever-closer together, and the company said you should find most of the key features from the Windows 8.1 app on the mobile versions. In some cases, like with Bing Food & Drink, the update actually adds additional new features not previously available on the desktop. For example, there’s now a “roaming” feature that syncs your shopping list between the two different platforms when using the Food & Drink app. Likewise, the Health & Fitness app will also sync your data between devices and platforms too, so you’re not expected to go out running with your laptop. In addition to officially launching the new apps, Microsoft also updated some of the other existing core apps like Bing Finance, Bing Sport and Bing News. For full details, check out Microsoft’s blog post.